We have been using the sheep/goat netting for 12+ years and still are using the original ones. 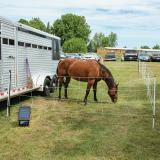 We needed some portable fencing for our mules and decided to try the horse netting. I love it! The 100 ft rolls are not too heavy, the double spikes keep the posts in the ground, and it looks great. 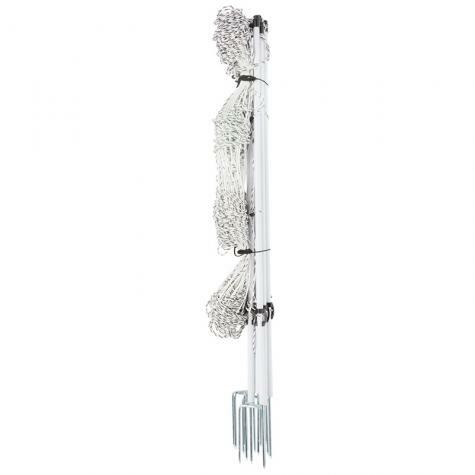 Only thing to watch is when you are rolling it up, if you are not careful, the netting will drape between the double spikes and get tangled. Pay attention (read the directions!) when rolling up and things will go just fine. These fences are great! 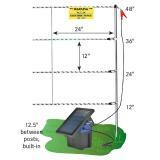 So easy to install and move around for rotational grazing. I've used similar products on other farms. 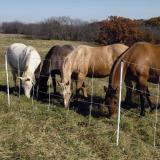 Using this fence to aid in the pasture rotation of our Mini Donkeys has been wonderful. I was able to teach a newbie how to break down and set up this fence in 20 minutes. 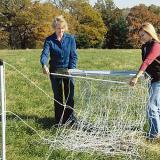 It's easy to keep tangle free and create a new pasture in no time at all. 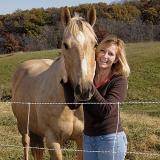 I rent the land so permanent fencing was not an option. After a few shocks the donkey's respect the fence and haven't escaped since! We are super pleased with it and our new ability to better steward the land. Great product. 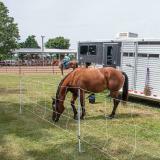 Bought the 100’ fence to make a temporary pen while traveling. Easy set up and take down. Does not take up space like most traveling pens. Plenty of room for 2 horses. Recommmend support post for the corners to help keep it tight. 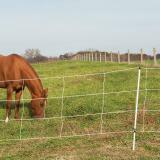 I needed extra pasture,so I bought it and it is working just like they said....easy to put up & take down.Also will be a quick corral when we go trail riding. Love it,works Great !! They got it to me in no time. I move it every couple of days as the pasture is slow growing this year.